Heartfelt and wonderfully acted, you’ll certainly laugh at The Florida Project, but the film has no easy answers to give. This is my favorite tree! Do you want to know why? Because even if it’s tilted on its side, it keeps growing. When Walt Disney was planning to expand his theme park empire in the early 1960s, he sought to prevent land speculation by people intent on securing the highest price that Disney could offer for their land. Walt and his team worked under the guise of dummy companies, quietly purchasing land for what they called “The Florida Project,” a development that would eventually become Walt Disney World. Walt himself called the park “the happiest place on earth.” The irony is that the world “project” has a fundamentally different meaning to America’s underclass: government-subsidized low-rent housing. 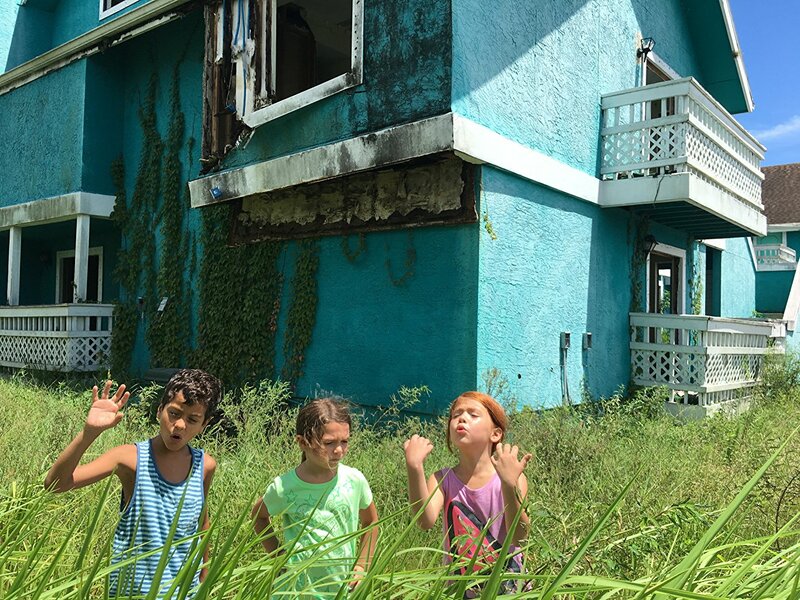 The Magic Castle motel at the center of Sean Baker’s film The Florida Project isn’t government funded, but it bears the other hallmarks of America’s public housing. The birthday cake-styled purple and cream paintjob is an unconvincing veneer for the motel’s interior dilapidation (though it is the basis for the film’s gorgeous pastel color scheme). The ice and laundry machines are constantly broken with promises that repair is “just around the corner,” and at least one room has bed bugs. Not that the majority of the motel’s residents have anywhere else to go. The Magic Castle is a waystation for the impoverished, featuring cheap enough rent that even the chronically jobless can scratch together a week’s expenses through various illegal and quasi-legal means. The Magic Castle is just one in a string of run-down motels, diners, and vacation-themed businesses on the edges of Disney property. Tenants at The Magic Castle, Futureland, and the Arabian Inn are constantly confronted by stores hawking discounted park tickets, gift shops, and even streets named after Disney characters, a stark reminder of their downtrodden existence in a place where the rest of the world goes for a week of escapist fun. The park is an unseen behemoth lurking at the edges of their reality, a tease of a better life with even The Magic Castle aping the name of Disney’s Magic Kingdom. That’s the world that Halley (Bria Vinaite) inhabits with her 6-year old daughter, Moonee (Brooklynn Prince). She’s a single mother who complains to her social worker that she can’t find work despite seemingly never leaving the confines of her motel room. It’s tough to wonder what job she would even be able to keep with her teal hair, and a mouth that inhales a constant chain of cigarettes and exhales an equally acrid stream of curses and sarcasm. She makes ends meet by bumming food off a waitress friend and selling knockoff perfume to guests at posh resort hotels. Moonee is frequently left to her own devices, and that usually means mischief. When we first meet her she’s spitting on cars from a motel balcony and sassing the adults who try to stop her. She and her friends Scooty (Christopher Rivera) and Jancy (Valeria Cotto) are a constant source of frustration to other motel guests and Bobby (Willem Dafoe), the manager who calls them “good kids” while also wishing they weren’t such a headache. It’s true. They are cute kids, and just how else would you expect them to behave with nothing to do, and a complete lack of money or supervision? Sean Baker and co-writer Chris Bergoch have written an incredible slice-of-life film that’s almost cinema verite in its capturing of these characters in their day-to-day lives. It has subtle plotting and a non-judgmental style that reminds me of last year’s Moonlight, another film about characters on the margins of society. There’s nothing flashy about Baker’s film, either. Its fly-on-the wall aesthetic wants us to experience Halley and Moonee’s lives in every facet, even if we can’t ever fully understand them. That matter-of-fact style extends to the cinematography and acting, too. Director of Photography Alexis Zabe’s work is tonally simplistic, eschewing complex tracking and dolly shots in favor of basic setups and occasional handheld sequences (also some key guerilla camerawork in a scene at the film’s end). Baker does the conservative editing himself. There’s nothing to distract from the characters, most of whom are portrayed by unknown actors and actresses, adding to the verisimilitude. 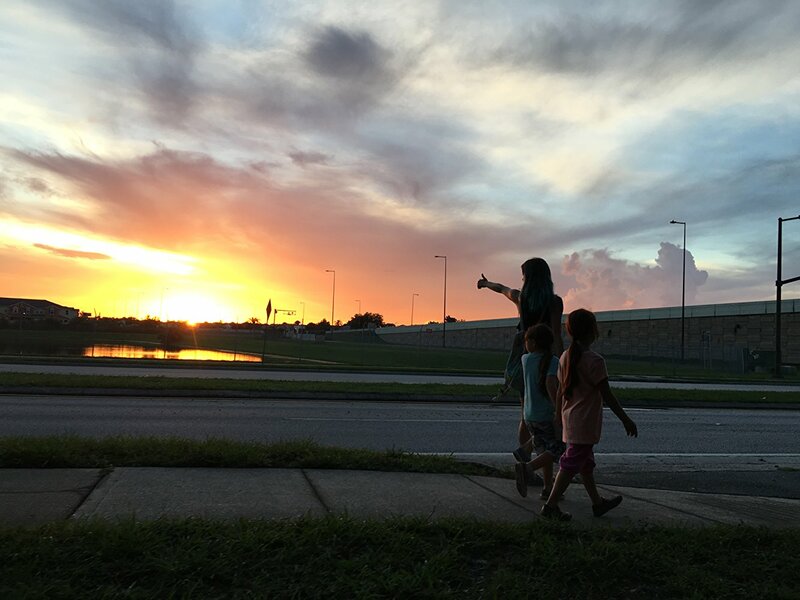 A new generation of directors have excelled at getting superb performances from children, a population that the old Hollywood adage advises you not to work with, and Baker performs a small miracle with Brooklynn Prince in The Florida Project. She’s so stunningly natural that I actually looked up her biography after the film and was shocked to see her only other acting credit is something called Robo-Dog: Airborne. It’s not crazy to imagine her getting awards nominations later this fall. Sean Baker adds himself to a recent list that includes Barry Jenkins’ Moonlight and Lenny Abrahamson’s Room as films that succeed because of and not in spite of their child actors. The one name audiences will know is William Dafoe, who does excellent work with a bare-bones script. That not a criticism of co-writers Baker and Bergoch, but rather high praise for Dafoe who finds humanity in movement and glances where a lesser actor could have been crushed by the non-flowery dialogue. Bobby’s constant gripes about Moonie, Scooty, and Jancy adding to his workload show an annoyed man on the surface, but his actions reveal a deeper caring for Moonie and her future. He’s the figure who berates Halley about responsibility, and keeps a watchful eye on the kids when predatory adults come lurking with their hands fumbling away in their pockets. He also can’t quite bring himself to evict Halley out of the Magic Castle despite her numerous crossings of the “last” lines he draws in the sand over her and Moonee’s behavior, and while the film is never dark or sinister, that does make it very sad. There’s a deep, problematic sorrow that pervades the film, as Moonee’s constant sassing and disrespect goes from hilarious, to uneasy, to achingly sad. You can only laugh at a precocious six-year-old curse so many times before you begin to ponder what the eventuality is. Halley is never there for Moonee, and, when she is, you wonder if it might be better if she weren’t. What chance does a child have when they’ve grown up getting laughs every time they curse, buck authority, or ignore education? What does a child gather from a parent who won’t help themselves? It’s playing with matches, and eventually Moonee is going to start a fire that she can’t put out with churlish cuteness. You’ll laugh at The Florida Project. So much of the film is a heartfelt look at the types of people who don’t often appear in the movies; those who live on the edges of a place we want to believe is flawless. But it’s also a film about turning a blind eye, from Disney overlooking this population, to a mother ignoring the precedent she’s setting for her child. A clichéd testament to the human spirit? No. This is an American tragedy. Previous PostReview: ‘THOR: RAGNAROK’ Hammers It HomeNext PostThe Best Video Games of the 2000s, Part 2.